ROMAN IMPERIAL - CIRCA 50-150 A.D.
M. Bailey, A Catalogue of the Lamps in the British Museum, London, 1996. G. Mitten, S. F. Doeringer, Master Bronzes from the Classical World, Los Angeles, 1968, pp. 298-99, fig. 297. 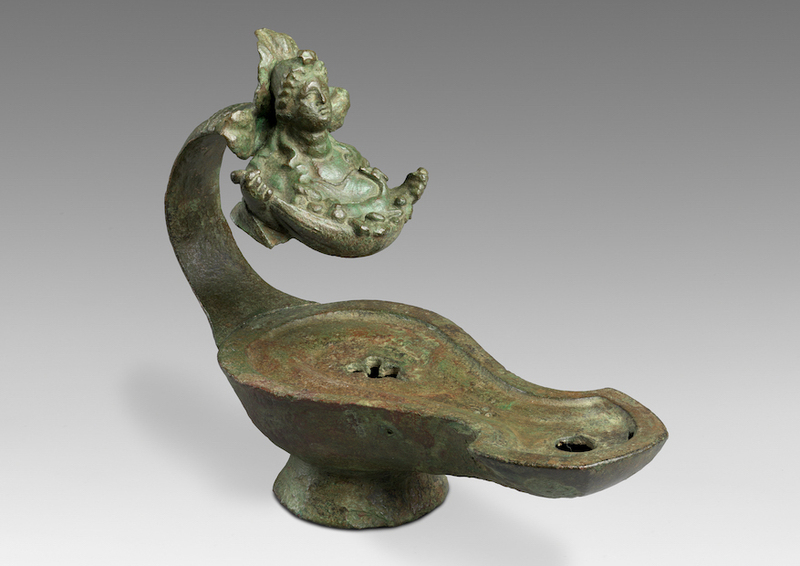 Elegantly cast, with its splayed foot-ring, pear-shaped body and voluted nozzle, the present oil lamp is typical of the high-quality production of the late 1st Century A.D. Such lamps would be fitted with a variety of handle finials, the one under discussion presenting a particularly fine one in the shape of a female figure – probably a priestess – springing from a lotus-shaped terminal and holding a cornucopia or sacrificial cluster of goods, including an exquisitely detailed goat. 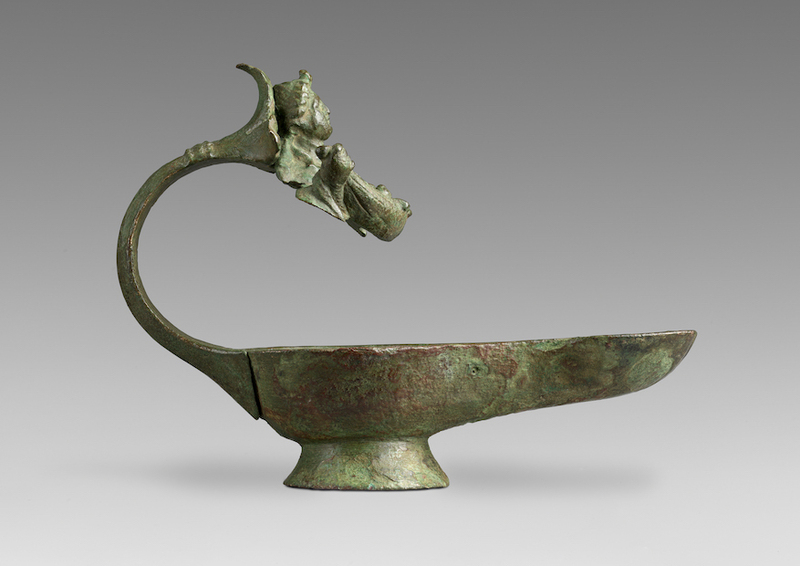 Other notable lamps in this group may exhibit satyr or equine heads. See, for instance, one in the British Museum also displaying an identical stemmed trefoil filling hole (fig. 1). Further examples particularly close to the present one are to be found in the Museo Archeologico Nazionale, Naples, and the Museo Archeologico Nazionale of Aquileia. 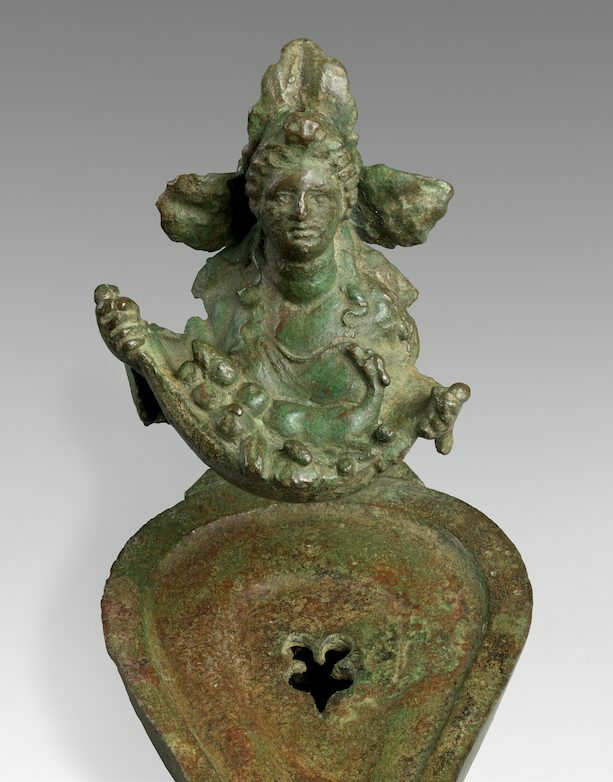 Although production of such lamps originated in Italy, probably Rome, they were disseminated throughout the Empire, with comparable examples having been excavated in Pompeii but also as far as Rhodes and Lower Nubia, Egypt.